XS (S, M, L, XL, 2XL). 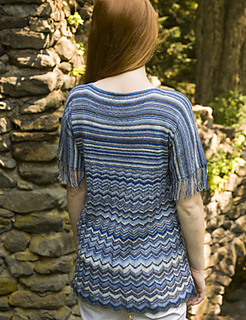 Show in size S.
Stripes and chevrons combine beautifully in this randomly striped V-neck tee. 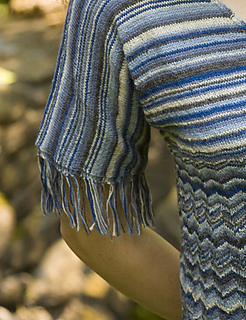 Despite the stripes, there are minimal ends to weave: the body is worked in the round, with unused colors carried up the side of work, and the ends from the stripes on the bodice are used for fringe on the dolman sleeves. Plus 0 (0, 0, 0, 1, 2) additional ball(s) chosen from the colors above (see Notes). Circular knitting needle (24”) in size US 3 (3.25 mm) or size to obtain gauge. Circular knitting needle (24”) in size US 2 (2.75 mm) or size to obtain gauge. Circular knitting needle (24”) in size US 1 (2.25 mm) or size to obtain gauge. 31½ sts and 36 rnds = 4” in Chevron 1 patt using largest needle, blocked. 36½ sts and 44 rnds = 4” in Chevron 3 patt using smallest needle, blocked. 38 sts and 48 rows/rnds = 4” in St st using smallest needle, blocked. Take time to save time, check your gauge.